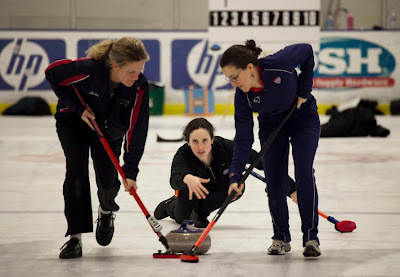 Jeff Cable's Blog: OLYMPIC RESEARCH: My first curling experience! Last night, in the spirit of research and Olympic preparations, I made a trip to the local ice rink to get my first glimpse of curling. I have played hockey at this rink for the last 9 years and never seen anyone play this game before. Hard to believe! Growing up in San Francisco (or just not being Canadian), this sport is new to me. 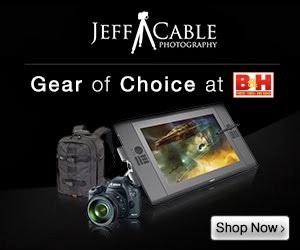 My goal was to go there to try and get an understanding of the sport, and figure the best way to shoot the game. I started by shooting at a relatively fast shutter speed (1/80th) to capture the intensity and action. This is a classic shot of the woman throwing the rock in between her two partners. The lighting is not great in this rink so I had to crank the ISO to 2500. I then switched to a side view to see what that would give me. I kept the focus on the rock figuring that this would be the "subject" of the image. The players were very nice to me and offered for me to stand in the middle to shoot images, but I declined, knowing that this would not be possible at the Olympics. Remember, I am trying to plan ahead for Vancouver and want to keep it as close as possible to the shooting conditions there. After freezing the action, I decided that it was time to get creative and worked on capturing the motion of the sport. Slowing the shutter to 1/13th, I panned with the participants to get some motion blur shots. I like these much better. I am sure that the lighting will be much better at the Olympics, but this may not be a good thing. I am going to bring an NDO filter (to darken the environment) in order to slow the shutter speed. I am not sure if I will need it, but at least I will have it in case! 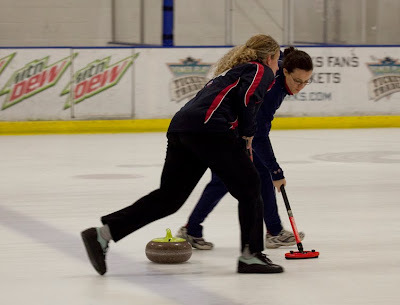 Thanks to Marjorie Taylor for the invite and the curling information! 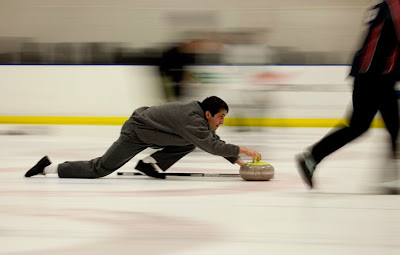 Check out this blog post from a photography who frequently covers curling. I am watching the Semi Finals in the Canadian Women's Championship. The Canadian rinks for the Olympics have all been decided. This is to decide who goes to the World's in March. Olympic Curling will be played in very bright hockey arenas. 4 ice sheets in play at once. All games will have TV lighting. Most photogs will be using 500-600mm lenses with monopods. 3200 ISO should give you 1/500 to 1/1000 sec easily. There will be hockey boards around the rink so the side access will be limited.